Mission: Restore believes surgical care is a key component to a strong health system. We identify countries with the greatest need and develop long term partnerships with hospitals serving the poorest populations. Our focus is on education. 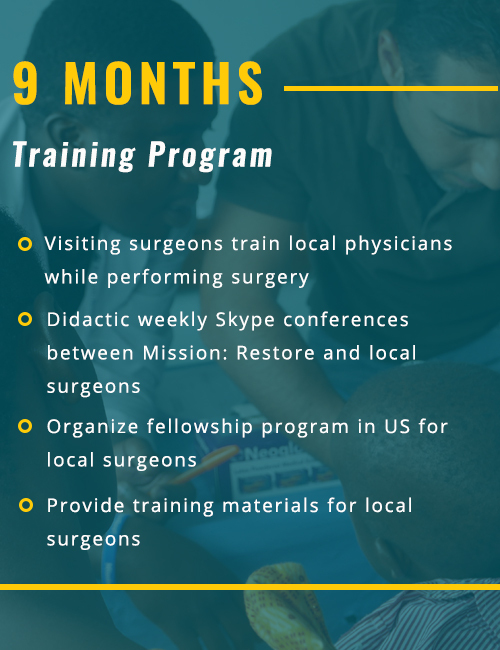 We invest in local surgeons through training and mentorship. We work with our partners to strengthen surgical capacity in order to create a strong and sustainable health system accessible to all. Hands-on trainings with top US surgeon educators. 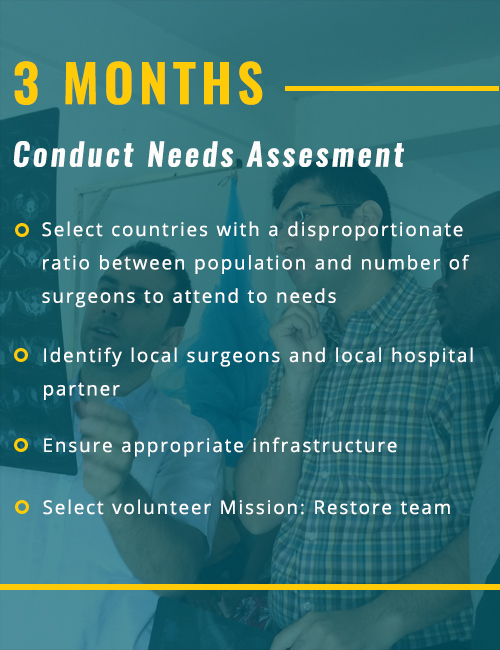 The majority of time is spent in the operating theater where local surgeons and Mission: Restore educators operate side by side. Investing in the next generation of reconstructive surgeons by supporting the specialized education of passionate, young surgeons. Leveraging technology to remain engaged with partners and provide ongoing consultations, mentoring and monitoring of outcomes. 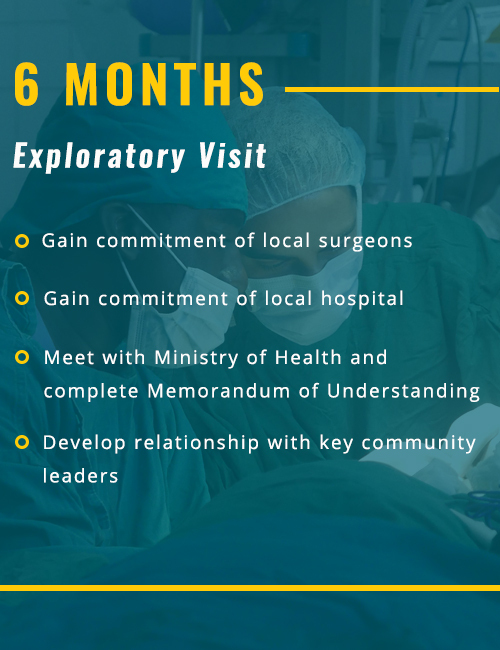 Each program is designed with an understanding of the culture, healthcare delivery system, and prevailing medical needs of each country, region and hospital. The changemakers who work in their communities to provide essential surgical care to patients in need. A Mission: Restore Surgical Education Grantees, Dr. Amanda is currently enrolled in the University of Nairobi Kenyatta National Hospital’s plastic and reconstructive surgery program. 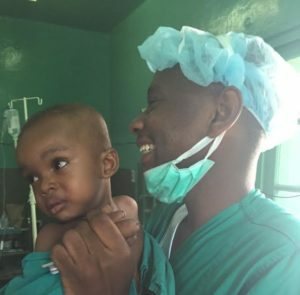 Amanda is an active member of our surgeon network and acts as a representative for Mission: Restore within East Africa’s reconstructive surgical community. 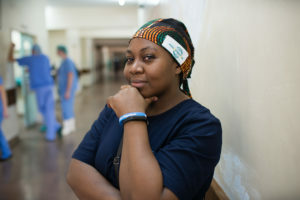 Upon completion of her degree, Dr. Amanda will become Zambia’s first female plastic surgeon and a leader within the field. Mission: Restore first worked with Dr. Maulid in 2015. At the time, Dr. Maulid was a registrar surgeon in Stone Town, Zanzibar. Dr. Maulid has been one of Mission: Restore’s most avid telemedicine users. After a recent training, where he first learned to perform skin grafts, he was immediately performing surgery independently and sending photos of the successful outcomes to our US surgeon educator who had mentored him. Due to his hard work and dedication, as well as his skills as a leader and community builder in the hospital, Dr. Maulid has been appointed Chief Hospital Administrator of Kivungue Cottage District Hospital in Zanzibar. While Maulid champions all types of surgery as Chief Administrator, his surgical interests concentrate on plastic and reconstructive surgery techniques. "It’s always easier and better to do procedures together because that is what surgery is about. You make a difference by your success in the operating room." 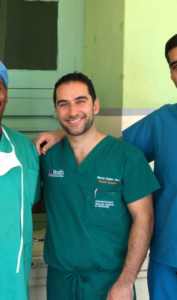 Dr. Paul was Mission: Restore’s first Surgical Education Grantee. When we first met Dr. Paul in Mwanza we were immediately taken by his talent, leadership and dedication to his community. 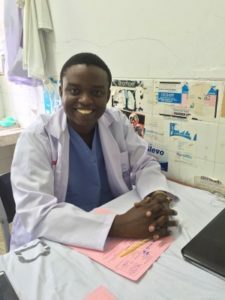 With the financial support of Mission: Restore Dr. Paul is now currently pursuing his Master of Medicine in Plastic and Reconstructive Surgery at the prestigious University of Nairobi in Kenya. Dr. Paul hopes to return to Tanzania to be one of the first formally trained reconstructive surgeons for his country. Dr. Silvio is based at St. Josephs Regional Medical Center in Patterson, New Jersey, but is a seasoned veteran when it comes to teaching and operating on reconstructive surgical cases internationally. Dr. Silvio has taught and performed surgeries all over the world including: Nigeria, Nepal, Zambia, Haiti and Jordan , to just name a few. He specializes in oral and maxiofacial pediatric surgery. 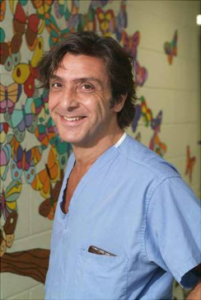 Dr. Silvio engages is known for engaging local surgeons through his creative teaching styles. He is notorious for playing music in the operating room, and his playlists are often requested by the local surgeons he mentors. 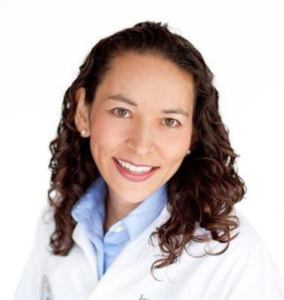 Dr. Joyce is an Associate Professor at the University of Colorado at Denver. For over three years, she has been a part of the Mission: Restore’s surgeon network. Dr. Joyce continues to inspire us, not only at Mission: Restore but in the larger surgical community. Alongside our female local surgeons in Tanzania, Dr. Joyce took part in the #ThisIsWhatASurgeonLooksLike campaign, empowering women of all backgrounds to keep pursuing their dreams in the medical field. Dr. Joyce specializes in breast and reconstruction and reconstructive microsurgery as well as skin cancer. Overall, Joyce has mentored six local surgeons across Tanzania and Myanmar. Dr. Morad has been an active educator in the Mission: Restore network since 2015. He has been part of four different training trips to partner hospitals in Zanzibar and Mwanza, Tanzania. Dr. Morad specializes in congenital hand deformity and wrist surgery and is an Associate Professor of Surgery and Orthopedics at the University of Miami. He is known for his one-on-one teaching methods, personalizing his trainings to match the needs and skill level of local surgeons working alongside him. He also conducts lectures and workshops outside of the operating room for general hospital staff, ensuring the entire surgical team is given the information and tools they need to achieve successful outcomes for patients.